PrintSmart for LEAP (formerly known as Scan to LEAP) allows for large documents to be captured and sent directly to the matter. LEAP Cost Recovery automatically allocate costs to the matter for scans and copies, whilst making any scanned content text searchable via optical character recognition (*OCR). Scan documents up to 120MB in size! Boab IT developed the PrintSmart for LEAP functionality to help Law Firms be more efficient and automatically capture the associated costs. To make life even easier, we have now included a PrintSmart for LEAP licence with every Sharp MFD sold by Boab IT. 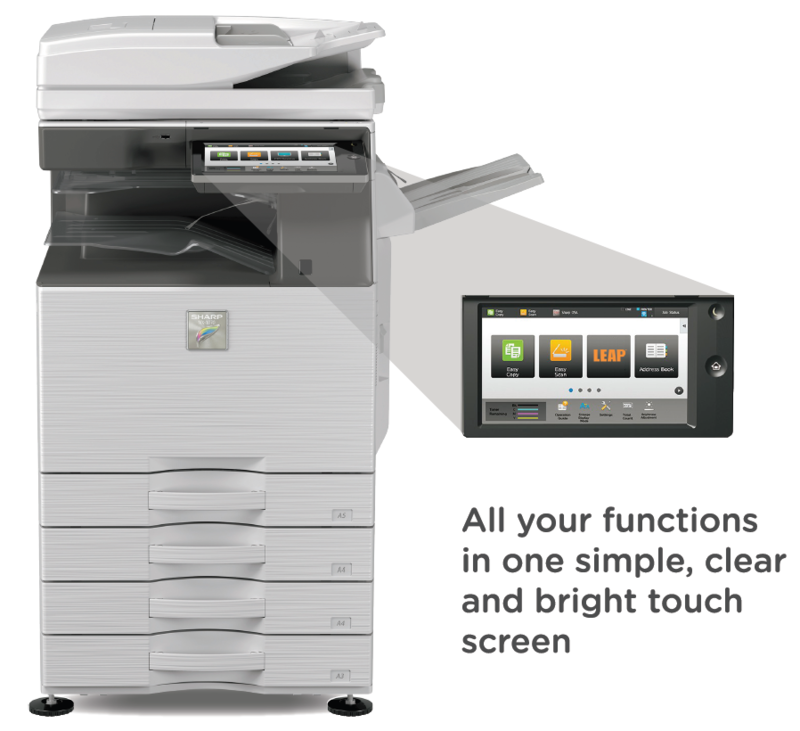 This simply enhances the already powerful solution a Sharp MFD can offer your firm. Whilst scanning a document may sound simple, there is quite a lot that actually happens with PrintSmart for LEAP. Here are the top three examples of what PrintSmart for LEAP can provide your firm. Traditionally, a document would be scanned to an email. The user would then find the email and uploaded or attach it to a matter. What if the scanned document was too big? It would never arrive or you would see a bounce back error. This can happen several times as large documents might need to be scanned in two, three or more parts. Who knows how many times you need to try until your scan is under these limits. PrintSmart for LEAP can handle hundreds of pages per single scan reducing time spent on capturing documents to a single file and/or matter helping improve overall integrity and consistency of your document management. Over 75% of firms don’t recover their document management costs accurately. The main reason behind this is the time it takes to manually record the information, usually once at the machine and again into the Practice Management or accounting application. PrintSmart for LEAP automatically allocates the cost recovery amount to the matter the document has been scanned to, whilst recording which user completed the work and when. What about copies? Not a problem, just select the whether its a duplex copy and the total number of copies and you are done. The time it can take to scan or copy a document varies. Whether a single page or complete brief needs to be digitised, when following the tradition scan to file or scan to email, there is a lot of double handling and wasted storage required to complete this simple task. With PrintSmart for LEAP, everything is done in one action and captured automatically reducing these tasks by saving each individual up to 60% of the time it would take following the traditional methods. What features are included with PrintSmart for LEAP? What happens when I order PrintSmart for LEAP? If you order PrintSmart for LEAP on its own, we will issue an authorisation key which is required to activate your Sharp MFD. We will also send a Setup Guide, which are also available online, showing you the steps needed to connect your Sharp MFD to PrintSmart for LEAP. This whole process takes lass than a few hours. Once you have setup your Sharp MFD, you will need to enter your LEAP username and password into our Portal to complete the integration. What are PrintSmart for LEAP minimum requirements? Performance of the PrintSmart for LEAP application is dependent on the upload speed of the internet connection at the location of the Sharp MFD. LEAP and Boab IT may make adjustments and improvements to the PrintSmart for LEAP integration which may impact on the speed documents are uploaded and receive by LEAP. OCR capabilities are dependent on the model of Sharp MFD.